(October 30, 2018 – Carrollton, TX) Putting up 14 isn’t an uncommon number for this time of year, except if you’re playing baseball. The Spirits (18+) fall squad did just that on Tuesday night as they unleashed on the Dallas Blue Jays to raise their record to 4-3 and to the fifth seed position moving into the NTABL Trinity Division’s final set of games. Colton Buckner remained red hot at the plate and the team received added help from Kyle Redinger and Duane Aponte as each of three players led the box score with 2 hits apiece. Each of them added a double and at least one free pass to first base as Blue Jays pitching was abysmal, allowing 11 Spirits hitters to walk to first. Cliff Brade and Mike Werner also added doubles on the night, while Buckner also finished the night with a triple, 3 runs scored and 3 runs batted in. Redinger added 2 runs scored and a pair of runs batted in, and Aponte scored twice as well. After Buckner drew a lead off walk in the first, Redinger doubled to score him and the Spirits had an early 1 to 0 lead. The squad made it 3 to 0 in the second after Adam Bartczak hit an inside-the-park homerun and Aponte doubled and eventually scored on a wild pitch. 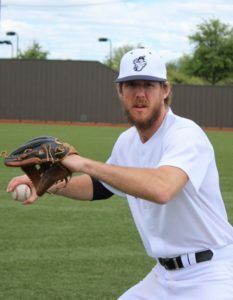 Redinger singled in the third and made his way around the base paths on wild pitches to increase the lead to, 4 to 0 and the squad was finally held without scoring in the fourth. 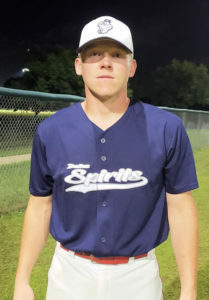 The Blue Jays picked up their one and only run in the bottom half of the fourth, but the Spirits blew the game wide open in the fifth with 4 more runs starting with Rudy Lucas drawing a walk and later advancing to third when Tom Miller grounded out. Buckner tripled to score Lucas and Werner doubled to score Buckner. Redinger drew a walk and both runners advanced on another wild pitch and Werner eventually scored on an error made by the Jays catcher. Redinger would eventually score on a sacrifice fly by Holden Novak to make it 8 to 1. The Spirits put up a 6 pack of runs in the sixth and it was over but the crying for the Blue Jays. The game’s final inning was highlighted by a 2-run double from Buckner and a 2-run double from Brade. The squad returns to action this Sunday after noon as they play host to the Dallas Orioles at First Baptist Academy in South Dallas. You can click here for schedule details, obtain driving directions to the game, or to download the iScore Central app to watch and listen to the game live, online!